Revenue insurance represents a new risk management tool in agriculture, based on the difference between the guaranteed and actual revenue of the entire farm or some production. Most commonly, crops that have a signifcant share in the structure of planting or significant yield are insured with the application of this tool. Mercantile corn is the most important feld crop in Serbia, and climatic conditions and price changes have a huge impact on its production. As one of the aspects of struggle with volatility of revenues there is a possibility to insure the corn revenue, by concluding the insurance agreement. However, the revenue insurance is very slightly applied in the world, while in our country in recent years is in its infancy. This paper analyzes the economic and legal aspects of the insurance model in order to determine the basic mechanisms of its functioning, as well as the conditions that must be fulflled so that conclusion of the agreement would have an economic justifcation for both parties (farmers and fnancial institutions). It also examines the normative framework for the conclusion of this agreement and stresses the differences relative to the classic insurance contract. 1. Ahmed O., Serra Teresa (2015): Economic analysis of the introduction of agricultural revenue insurance contracts in Spain using statistical copulas, Agricultural Economics, Vol. 46, No. 1, pp. 69-79, Blackwell Publishing, Malden, United States. 2. Berg, E. (2001):Analyse des Systems der Ernte- und Einkommensversicherungen in den USA. Abschlußbericht zum Forschungsvorhaben gefördert von der Deutschen Forschungsgemeinschaft, Aktenzeichen: BE 1341/4-1, Bonn. 3. Bielza, Maria, Garrido, A., Sumpsi, J. M. (2002): Revenue insurance as an income stabilisation policy: An application to the Spanish olive oil sector. Xth EAAE Congress “Exploring Diversity in the European Agri-Food System”, Zaragoza, Spain. 4. Binswanger, H. P. (1986): Risk Aversion, Collateral Requirements, and the Markets for Credit and Insurance in Rural Areas. In: Hazell, P., Pomareda, C. and Valdés, A. (Eds. ): Crop Insurance for Agricultural Development, Baltimore, pp. 67-86. 5. Carić, S., Vitez, M., Raičević, V., Veselinović, J. (2011): Privredno pravo. Fakultet za ekonomiju i inženjerski menadžment, Novi Sad. 6. Goodwin, B.K., Ker, A.P. (1998): Revenue insurance: a new dimension in risk management, Choices, Vol. 13, No. 4, pp. 24-27, AAEA, United States. 7. Hardaker, J.B., Huirne, R.B.M., Anderson, J.R., Lien G. (1997): Coping with Risk in Agriculture, CABI Publishing, Wallingford, United States. 8. Knight, T. O., Coble, K. H. (1997): Survey of U.S. Multiple Peril Crop Insurance Literature since 1980. Review of Agricultural Economics, Vol. 19, No. 1, pp. 128-156, Oxford Journals, United States. 9. Marković, T. (2013): Vremenski derivati i upravljanje rizikom u poljoprivredi, Univerzitet u Novom Sadu, Poljoprivredni fakultet, Novi Sad. 10. Marković, T., Jovanović, M. (2011): Rainfall insurance in wheat production with weather derivatives, Economics of Agriculture, Vol. 58, No. 2, pp. 179-189, IAE Belgrade, Belgrade, Serbia. 11. Meuwissen, M. P., Huirne, R., Hardaker, J. B. (1999): The feasibility of farm revenue insurance in Australia. In 1999 Conference (43th), January 20-22, Australian Agricultural and Resource Economics Society, Christchurch, New Zealand (No. 124090). 12. Mishra, A. K., Goodwin, B. K. (2006): Revenue insurance purchase decisions of farmers. Applied Economics, Vol. 38, No. 2, pp. 149-159, Routledge, Abingdon, United Kingdom of Great Britain. 13. Ray, P.K. (1991): A Practical Guide to Multi-Risk Insurance for Developing Countries, New Delhi. 14. Schlieper, P. (1997): Reduktion des pﬂanzlichen Produktionsrisikos durch eine Ertragsausfallversicherung. In: Bauer, S., Hermann, R., Kuhlmann, F. (Hrsg. ): Märkte der Agrarund Ernährungswirtschaft - Analyse, einzelwirtschaftliche Strategien, staatliche Einﬂußnahme, Schriften der Gesellschaft für Wirtschaftsund Sozialwissenschaften des Landbaues e.V., Bd. 33, S. 219-232, MünsterHiltrup, Germany. 15. Skees, J. R. (1999): Agricultural Risk Management or Income Enhancement. Regulation, Vol. 22, No. 1, pp. 35-43, Cato Institute, Washington, USA. 16. Veselinović J. (2011): Privredno pravo. Univerzitet u Novom Sadu, Poljoprivredni fakultet, Novi Sad. 17. 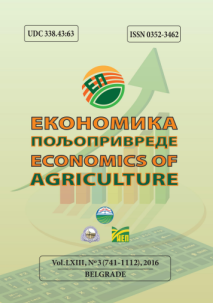 Veselinović, J., Marković, Т., Đukić, S. (2014): Analysis of Legal and Economic Aspects of Precipitation Weather Derivatives for Serbian Agricultural Sector, Economics of Agriculture, Vol. 61, No. 4, pp. 1053-1067, Belgrade, Serbia. 18. Weidenfeld, G. (1991): All-Risks Versicherung, Bergisch-Gladbach, Köln. 19. Wright, B. D., Hewitt, J. A. (1994): All-Risk Crop Insurance: Lessons from Theory and Experience. In: Hueth, D.L. and Furtan, W.H. (Eds. ): Economics of Agricultural Crop Insurance: Theory and Evidence, Natural Resource Management and Policy, Dordrecht, pp. 73-112. MARKOVIĆ, Todor; VESELINOVIC, Janko; KOKOT, Željko. REDUCATION OF VOLATILITY YIELD AND PRICES IN CORN PRODUCTION USING REVENUE INSURANCE. Economics of Agriculture, [S.l. ], v. 63, n. 3, p. 959-971, aug. 2016. ISSN 2334-8453. Available at: <http://ea.bg.ac.rs/index.php/EA/article/view/209>. Date accessed: 19 apr. 2019. doi: https://doi.org/10.5937/ekoPolj1603959M.